Tenerife is the perfect holiday destination if you're looking for beach weather all year round, but if you're looking for a break from the sun then a shopping trip might be what you need. Although it's an island, Tenerife offers good shopping opportunities, from large shopping malls to local markets, craft markets and even farmer's markets. You can find everything from clothes, jewellery, souvenirs and electronics, but you should be careful in which shops you choose to spend your money. buying electronics in Tenerife - when shopping for electronics like cameras, smartphones or other accessories you should always go to a reputable store, which you will usually find in the big commercial centers. Don't buy cameras or other expensive gears from the Indian or Chinese shops that you'll find on the promenades, no matter how good of an offer it may seem in the moment. This way you'll avoid the risk of buying a fake or defective product, plus you have to think about the warranty, in case you might need to get it repaired at some point. If the electronics are not bought through official channels, they most probably don't have a warranty certificate that is valid in case of repairs. buying jewellery in Tenerife - Tenerife is the perfect place for a romantic holiday and a destination for an unforgettable proposal, wedding or vows renewal. If you're planning on buying an engagement ring in Tenerife, make sure you buy it from a reputable store, who can offer you a certificate of authenticity. If you're buying a precious stone like a diamond, the certificate should be typed (not just handwritten) and the evaluation should be done by a specialized company, not just by the store where you are buying. When spending a considerable amount of money on a special piece of jewellery, be sure that you choose a serious company and even make an online research before buying, to see what their reputation is, what other customers say and how long they've been on the market. Sadly, many people have bought jewellery items here with a good intention, only to find out back home when they tried to insure that piece of jewellery that it's not worth the money they paid, or that it doesn't even have the amount of karats that they paid for. buying cosmetics and perfume in Tenerife - perfume is usually more affordable in Tenerife compared to airport prices, so if you want to buy your favourite scent you should buy it at one of the many shops around the resorts. We recommend Fund Grube, Perfumerias Sabina, perfumes.es. Basically, you should always use your common sense and be skeptical when the price seems too good to be true. Since Tenerife is a holiday island, filled with tourists in spending mode, many shop owners will try to take advantage and sell overpriced items or fake products, so make sure you shop around before buying anything expensive. Most electronics will even be more affordable to buy from the UK, mainland Spain or any other countries in Europe, since there are more shops there and more competition. Siam Mall - our personal favorite place for shopping in the south - (Av. 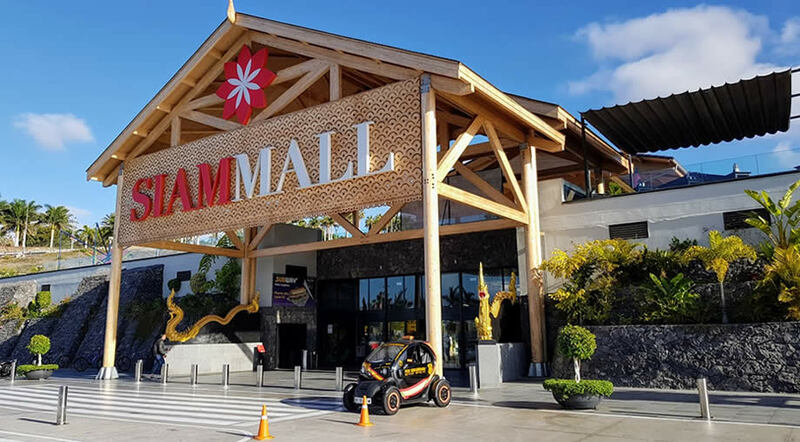 Siam, 3, 38670 Costa Adeje) this is probably the largest shopping center in the south of Tenerife and the best place to go if you want to find all the big Spanish clothing brands in one place: ZARA, Bershka, Mango, Pull & Bear and much more. There's also a Hiperdino supermarket, free parking and an outdoor terrace with lots of places to eat. Siam Mall also has a free shuttle bus that runs daily on 2 different routes, so it's really easy to get there even without a car or a taxi. Centro Comercial Gran Sur (Calle Lisboa, 2, 38660 Adeje) - this used to be our go to place for shopping in the south of Tenerife, but since the opening of Siam Mall it's not that attractive anymore. There aren't any big brands here and the food choice is slim, so if you're in the south of the island you are better of going to Siam Mall. Los Cristianos market - on Tuesdays and Sundays from 9 am to 2 pm. Here you'll find everything from souvenirs, to clothes, decorations but mostly fake products like bags, watches, clothing items. It's usually very crowded and you should be extra careful with your wallet and personal belongings, as there are a lot of pickpockets going around. Always haggle before buying something, as most of the stall owners put ridiculous prices on their items. If you want to buy local fruit and produce, head over to either Arona market or Adeje market, where you'll get the freshest vegetables and fruits on the island, as well as other items like goat cheese, honey or eggs. If you want to make a shopping trip to the north of Tenerife, then Santa Cruz de Tenerife, the capital of the island, is your best choice. Centro Comercial Meridiano - home to the only Primark in Tenerife, which is the main reason most tourists will come to this specific shopping mall. Also, it's quite large and you get a really good variety of shops, plus a Carrefour supermarket for grocery shopping. Corte Ingles - The popular department store even has a free shuttle bus from the south, but you will have to show a receipt from the store in order to get the free ride back in the after noon. Mercado de Nuestra Senora de Africa / Market of Our Lady of Africa - this is a famous food market in the capital of Tenerife, open every day from 9 am to 2:30 pm.